RICHMOND — The Edison softball team has had a memorable week. For the second time in less than a week, Edison won a championship, while St. Clairsville lost out on another. The Wildcats fell behind early, rallied to take a four-run lead then held on to defeat the Red Devils, 5-4, to win the Buckeye 8 Tournament championship Wednesday at Jefferson Lake State Park. Edison has now won three straight Buckeye 8 titles, and the Wildcats and the Red Devils have played for the title for four years in a row. “It’s good,” Edison (16-6) head coach Spencer Bendle said. “It is good whenever you can win a local league title. This is nothing big in terms of our goals. This is not our ultimate goal, but it is a step on the way. St. Clairsville out-hit Edison, but the Red Devils struggled to come up with clutch hits. McConnell battled throughout the game en route to picking up the win. She struck out three, walked two and allowed four runs (three earned) on 11 hits. Both teams belted a pair of home runs. 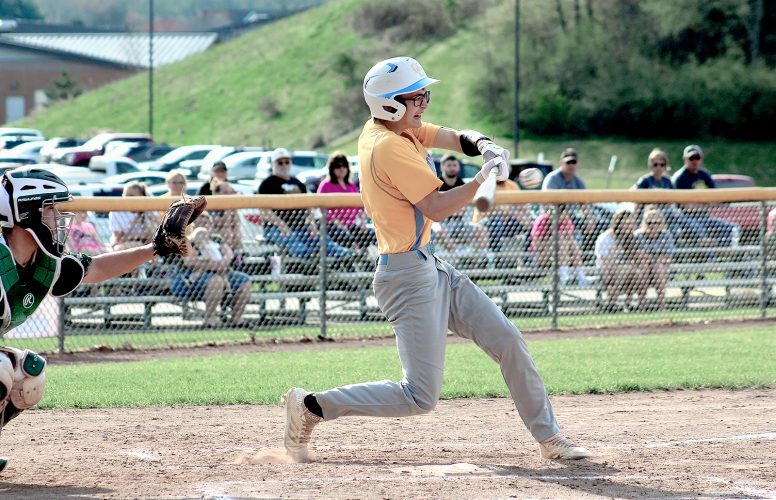 Edison’s were hit to right-center, while St. Clairsville’s were hit to left, and the Wildcats smacked three doubles, while the Red Devils recorded two. Individually for Edison, Hannah Christoff crushed a two-run home run, Mikayla Petrisko produced a solo home run and McKenzie Morrison collected an RBI double. McConnell collected an RBI single to help her cause. Emily Andreozzi and Emily Ferrell each added a double. For St. Clairsville, Bree Bennington and Ari Reager each recorded three hits, including a solo home run. Reager contributed a single and a double for her other two hits, while Bennington singled twice. Smith singled and brought home a run with a double. Maddy Vickers singled home a run. Bennington launched her home run with two outs left in the top of the first to give St. Clairsville a 1-0 lead. The Wildcats countered with a pair of runs in the home half. Emily Andreozzi doubled with one out, and she scored to tie the score at 1-1 on Morrison’s double. Next, McConnell singled, scoring Morrison to give Edison a 2-1 lead. In the home half of the fourth, catcher Kennadie McElroy reached on a one-out error, and Alli Grimes came in to run for her. Then, Christoff stepped to the plate and launched a two-run home run over the fence to give the Wildcats a 4-1 lead. Petrisko followed her with solo home run, giving Edison back-to-back homers and enabling the Wildcats to extend their advantage to 5-1. The Red Devils plated a run in the fifth, one in the sixth and another in the seventh, but it was not enough to extend the game. Smith doubled home a run in the fifth, Vickers collected an RBI single in the sixth and Reager led off the seventh with a solo home run. Edison won the Buckeye 8 North Division championship, while St. Clairsville won the South Division championship. St. Clairsville is scheduled to play at 5 p.m. today at home against Catholic Central. Edison’s next game on the schedule is at 5 p.m. Friday at home against Cambridge. EDISON (16-6): McConnell (WP, CG, 4R, (3ER), 11H, 3K, 2BB) and McElroy. TWO OR MORE HITS: St. Clairsville 3 (Bennington 3, Reager 3, Smith 2); Edison none. DOUBLES: St. Clairsville 2 (Reager, Smith); Edison 3 (Andreozzi, Morrison, Ferrell). TRIPLES: St. Clairsville none; Edison none. HOME RUNS: St. Clairsville 2 (Bennington, Reager); Edison 2 (Christoff, Petrisko). RBIs: St. Clairsville 4 (Vickers, Bennington, Reager, Smith); Edison 5 (Christoff 2, Morrison, McConnell, Petrisko).